See Caltrain for the commuter rail service currently operating on the San Francisco Peninsula. Since 1863 the San Francisco Peninsula, the series of towns (and later, cities) between San Francisco and San Jose, has been served by a railroad. The San Francisco and San Jose Railroad first provided freight and passenger service, followed by its successor, the Southern Pacific, and then briefly by the California Department of Transportation (Caltrans) and finally by a regional Joint Powers Board which runs today's passenger trains. Although a line had been proposed in the past, construction on the railroad between San Francisco and San Jose was started in 1860 "by a group of local capitalists of more than ordinary energy and resources" under the auspices of the San Francisco and San Jose Rail Road (SF&SJ), and completed in 1863. The Central Pacific Railroad transferred its rights for the construction of the right-of-way between San Jose and Sacramento to the Western Pacific Railroad (WPRR, which was founded by the same members that had founded the SF&SJ) in late 1862. In December 1865, the Southern Pacific Railroad Company (SP) was incorporated to build a rail line between San Francisco and San Diego. By the end of 1868, it was revealed the Big Four of the Central Pacific consisting of Stanford, Huntington, Hopkins, and Crocker had a controlling interest in the SF&SJ and SP, and the SF&SJ, SP, the Santa Clara and Pajaro Valley Railroad, and the California Southern were folded into a consolidated Southern Pacific Railroad on October 12, 1870. Under Southern Pacific the line was double tracked in 1904 and multiple cutoffs were built over a period ending in 1910. The first of these, the Bayshore Cutoff, opened in 1907 and rerouted the line through a series of five tunnels built along the shoreline of San Francisco Bay. This saved approximately three miles and seventeen minutes compared to the prior route, which veered to the west around San Bruno Mountain. The Bayshore Cutoff also eliminated the use of helper engines to bring trains over the mountain. The second, the Mayfield Cutoff, opened in 1908 to provide service to western Santa Clara Valley cities such as Los Altos and Los Gatos. The third, the Dumbarton Cutoff, opened in 1910 and included the first bridge across San Francisco Bay, between Newark and Menlo Park, saving many miles to Oakland and Sacramento compared to the prior route through San Jose and Santa Clara. The Peninsula Electric Railroad was incorporated around the same time the Dumbarton Cutoff project was launched, and it was suspected that it was controlled by Southern Pacific in preparation for a quad-track expansion, as it was laying a route parallel with the Southern Pacific. As envisioned in 1909 from plans for the Peninsula Electric, SP announced that it would investigate the electrification of its Peninsula Commute line in September 1921, promising better and more frequent service. Just a few days later, SP cited excessive post-war inflation, taxation, and competition from publicly-funded highways as factors making electrification neither "practicable or desirable". Similarly, plans to eliminate all at-grade crossings were announced in 1909, but not carried to completion. SP's Peninsula Commute experienced record ridership during World War II. During the war, 26 trains ran between San Jose and San Francisco per day, with headways as low as 5 minutes (traveling north) in the mornings and 3 minutes (traveling south) in the evenings. After the war, a May 1946 railroad strike displaced approximately 10,000 train passengers onto highways, causing "historic" traffic jams along the Bayshore Highway, with commute times for some automobile drivers to balloon from 30 minutes to 75 minutes going from Burlingame to San Francisco, a distance of approximately 19 miles (31 km). In 1954, surveys comparing traffic on Bayshore Highway with train traffic concluded that just over half of all commuters to San Francisco passing through Brisbane were taking the train, and that eight more lanes would need to be added to the freeway to accommodate traffic if rail service were to stop suddenly. However, in the period after the war, Peninsula roads were improved; the four-lane undivided Bayshore Highway (completed in 1925) was rebuilt into a six-lane divided freeway between 1949 and 1962, and Interstate 280 was completed in the 1970s. Train ridership declined with the rise of automobile use, falling from a peak of 9.2 million annual boardings in 1954 (approximately 16,000 weekday riders) to 4.4 million in 1977 (approximately 7,000 weekday riders). During peak hours, Peninsula Commute trains operated with headways as low as three or four minutes; however, with skip-stop and express train service patterns, the minimum wait for riders at a given station would be ten minutes. During off-peak hours, service frequencies dropped to longer than two hours between trains. On several occasions during the 1960s and 1970s, SP attempted to discontinue the commute service due to increasing deficits and stagnant ridership. Ridership was 11,500 daily passengers on 22 trains in 1970, compared to 12,000 daily passengers in 1967 and 10,000 daily passengers in 1946. In 1971, when Amtrak took over long distance passenger operations, Southern Pacific's extended commute train to Monterey, California, the "Del Monte", was discontinued. Some SP passenger locomotives were sold to Amtrak and the remainder were transferred to Peninsula Commute service, which continued to operate. In 1975, the Metropolitan Transportation Commission (MTC) published the Feasibility of Upgrading Peninsula Passenger Rail Service (PERSUS) report. PERSUS concluded the Peninsula Commute was underutilized and proposed a minor upgrade to improve service (and ridership), or major upgrades to extend service to downtown San Francisco, either by connecting with BART in Daly City, or by extending the SP terminus to the Transbay Terminal; the ultimate goal was to remodel the service to be closer to transit than commuter rail, which entailed a reduction in headways so that passengers would have to wait less than fifteen minutes between trains during weekday daylight hours. However, by that time the Peninsula Commute was no longer profitable: operating deficits were rising, from US$670,000 (equivalent to $5,412,000 in 2018) in 1964 to over US$1,000,000 (equivalent to $7,200,000 in 2018) by 1968, US$5,300,000 (equivalent to $24,680,000 in 2018) by 1975, and US$9,000,000 (equivalent to $39,630,000 in 2018) just one year later in 1976 according to an independent review, which prompted SP to petition the California Public Utilities Commission (CPUC) for a fare increase of 111 percent in August 1974, as fares had increased minimally and ridership, approximately 12,000 passengers per day in 1967 remained flat, despite the fuel crisis. The CPUC authorized a 25% increase in fares in a 3–2 vote on July 12, 1977, effective August 1977. Because the CPUC decision process was so slow, SP President Benjamin Biaggini offered to purchase 1,000 eight-passenger vans and donate them for vanpools in exchange for permanently discontinuing the Peninsula Commute service. The strange result in the decision of the majority is a travesty of justice. Ironically, it is so bad it is likely to even jeopardize the interest of the one group who seems to benefit, that is the present SP commuters who are being so heavily subsidized by others. Danger to commute interest comes from the real possibility that the ICC may require abandonment of train commute service because it finds the present intolerable situation constitutes an undue burden on interstate commerce. From our involvement in the case we have seen nothing that could be used to prove that the ICC is wrong in taking this unfortunate action. On May 6, 1977, SP formally filed a petition with the CPUC (Application No. 57289) to discontinue the commuter operation due to ongoing losses. At that time, SP was running 44 trains a day. The petition was opposed by regional transit agencies, including the MTC, who passed Resolution No. 479 to request the CPUC deny the SP petition. On October 17, 1977, the administrative law judge issued an order asking "Who will pay the cost of this regional insurance against the uncertainties of tomorrow? In the interim period, CALTRANS, the Metropolitan Transportation Commission, and the three counties involved are directed to meet, consult, and plan toward whether they will be willing to obtain funds under the provisions of the Urban Mass Transportation Act and their own resources to meet the operating deficit of Southern Pacific's commute and transit operations." Since the CPUC had not taken action on the petition 120 days after the filing, SP filed another petition to discontinue service with the Interstate Commerce Commission (ICC) on November 17, 1977. Although the CPUC denied the SP application on April 19, 1978, jurisdiction had already passed to ICC. In response to the CPUC petition, Assemblymember Lou Papan wrote Assembly Bill 1853, which allowed local transit districts served by the Peninsula Commute to purchase tickets from SP at face value and sell them to riders at a discount, subsidizing passengers. AB 1853 also allowed the California Department of Transportation (Caltrans) to negotiate with SP for operation of the commuter rail service and the purchase of the right-of-way between Daly City and San Bruno, which had only seen occasional freight traffic since the completion of the Bayshore Cutoff in 1907. Preservation of rail service was seen as critical to ensuring traffic would continue to flow, as both the Bayshore Freeway and I-280 were nearing capacity; and to preserve air quality in the region. The right-of-way between Daly City and San Bruno was seen as key to a planned extension of BART to San Francisco International Airport, an extension that eventually opened in 2003. In a December 1977 public hearing before the Assembly Committee on Transportation held in San Jose, SP executive Alan DeMoss testified that "rail commute service should no longer be cross-subsidized by other railroad activities" and offered $8 million to help purchase buses to replace the service. However, both samTrans and the Santa Clara County Transit District stated they would not be able to operate that bus service; it was estimated that a fleet of 122 buses would be required, arriving and departing from San Francisco every 35 to 50 seconds. Testifying later at that same hearing, samTrans chair John Mauro pointed out that since the inception of the San Mateo County bus service in 1975, service to San Francisco was deliberately crippled in speed to avoid competing with the rail service. Mauro had previously tried to negotiate with SP to enter a "purchase of service" contract in March 1976, but SP refused to accept a direct subsidy, which led to the passenger fare subsidy instead. During that hearing, the committee chair, Walter Ingalls, stated bluntly the state was not "going to authorize either Sam Trans or Santa Clara County or San Francisco County or any of the three to buy and operate a railroad. [...] No one's going to offer to buy your railroad." SP had previously offered to sell MTC a single track along the right-of-way between San Bruno and San Jose in December 1975, which could have been used to extend BART, but the offer was not taken. Ridership increased during 1979 and 1980, aided by the gasoline crisis and fare subsidies; the Peninsula Commute was so sensitive to gasoline prices that ridership jumped by 40% in May and June 1979. SP's ICC petition received a preliminary affirmative ruling from the administrative law judge in July 1979. To preserve the commuter service, Caltrans took over financial responsibility on July 1, 1980 (1980-07-01), and contracted with SP to operate the service. In the first fiscal year, covering 1980–81, operating costs were $19.33 million and fare revenue was $7.81 million, resulting in a farebox recovery ratio of 43%. The deficit was covered by a mix of Urban Mass Transportation Act funds ($2 million), contributions from SP ($400,000), and the state and three counties served ($4.56 million each). During state administration, Caltrans purchased new locomotives and cars that replaced the SP equipment in 1985 and provided push-pull service (removing the need to turn locomotives around at terminals), upgraded stations, introduced shuttle buses to nearby employers, and renamed the operation Caltrain. However, ridership continued to decline and the farebox recovery ratio fell to 34.3% in the 1983–84 fiscal year, which violated the minimum of 40% set by AB 1010 in 1982. The state felt that regional control of the Peninsula Commute was more appropriate, as it was primarily a benefit to the region, not the state, and the Peninsula Corridor right-of-way was purchased for US$202,000,000 (equivalent to $371,600,000 in 2018) from SP in 1991 by the newly-formed Peninsula Corridor Joint Powers Board (PCJPB), who subsequently assumed responsibility for the operation of Caltrain in 1992. SP took over the Peninsula Corridor route from the SF&SJ in 1870 and assumed control of the existing set of locomotives and passenger cars, which were mainly 4-4-0 steam engines and 36-passenger wooden railcars. As SP began introducing diesel locomotives on its long-distance (main-line) routes, steam engines were moved into Peninsula Commute service, culminating in the use of the large "General Service" 4-8-4 locomotives which served the Peninsula Corridor through 1957. Diesel-electric Fairbanks-Morse Train Masters had been running in Peninsula Commute service since 1954. Fairbanks-Morse and, later, EMD diesels served the Peninsula Commute past 1980, when the state-run CalTrain began assuming financial responsibility for the service, and were not retired until 1985, when the state purchased new EMD F40PH locomotives. One of the factors driving the purchase of new locomotives was the dramatic increase in annual lease costs in 1985. "Pacific" 2400–2404 c.1923/24–1954 Built 1904; displaced from main-line passenger service by 4-8-2 locomotives. Baldwin 2405–2427 Built 1906–1907; displaced from main-line passenger service by 4-8-2 locomotives. "Mountain" 4300–4327 c.1945–1954 Built 1923–1924; displaced from main-line passenger service by 4-8-4. GS-1 4400–4409 c.1950–1957 "General Service" or "Golden State" class built 1930; displaced from main-line passenger service by diesel-electric locomotives. With population (and ridership) growth on the Peninsula, the initial mix of 4-4-0, 2-6-0, and 4-4-2 locomotives were replaced by 4-6-0s. Older locomotives were redesignated to Commute service after they were displaced by newer locomotives assuming main-line (long-distance, inter-city) passenger service. Pacific-type 4-6-2s were used on peak-hour commutes by the 1930s and 1940s, displacing 4-6-0s, and more 4-6-2s were made available for the Commute by the introduction of 4-8-2s in main-line service; by 1945, the 4-8-2s were displacing 4-6-2s on peak-hour trains, 4-6-2s were moved to off-peak service, and 4-6-0s were used on weekend trains. By the early 1950s, peak-hour trains were pulling up to seventeen cars in a single consist, requiring the use of the "General Service" class 4-8-4s. After gaining experience with diesel engines in main-line service, SP began testing various diesel locomotives for the Peninsula Commute, finally selecting the Fairbanks-Morse H-24-66 "Train Master" because the relatively short distance between stations meant acceleration (and power) was the paramount priority. The final steam-led Peninsula Commute train departed San Francisco for San Jose on January 22, 1957, led by 4-8-4 No. 4430. However, 4-6-2 No. 2472 was moved from San Francisco to San Jose at the head of Caltrain #74 on December 16, 1994; #2472 was to lead a special charity excursion train back to San Francisco the next day. While coupled to Caltrain #74, though, #2472 was used to help accelerate the train out of each station, so it was not just a cosmetic appearance. #2472 has since been used occasionally along the Peninsula Corridor for special service, but not while providing revenue passenger service. EMD EMD GP9 3186–3196 1954–1985 Initially built as 5600–5603, 5622–5625, 5893–5895; renumbered to 3000–3010 in 1965-66; renumbered to 3186–3196 in 1975. Reverted to SP control in 1985 after lease expired. At least two survived: 5623 and 3194. Fairbanks Morse FM H-24-66 3020–3035 1954–1975 Delivered as 4800–4815; 4800 and 4801 were the F-M "western" demonstrators TM-3 and TM-4. Renumbered to 3020–3035 in 1966. All retired and scrapped once major rebuilds were required. EMD EMD SDP45 3200–3209 1971–1985 Moved from long-distance (inter-city) service after Amtrak takeover in 1971. Replaced F-M H-24-66 as they were retired. Pulled from duty in 1978–79. Reverted to SP control in 1985. EMD EMD SD9 4450 Huff and 4451 Puff 1973/74–85 4450 was scrapped in Portola, California after featuring for years in the collection of the Golden Gate Railway Museum. 4451 still survives in 2017, in derelict condition, at Schellville, California. EMD EMD GP40P-2 3197-3199 1974–1985 Supplemented SDP45s. Reverted to SP control in 1985. Rebuilt as GP40-2 to remove steam generators for passenger car heating once leases reverted to SP. Currently in service: Union Pacific 1373, 1375; Indiana Harbor Belt 4010. GE Transportation Systems GE P30CH Amtrak 7xx (15 total) 1978–79 Leased to SP for 1978–79 after SP SDP45s were pulled from passenger service under an ICC order to return offline freight cars. The first diesel on the Peninsula Commute ran on September 28, 1953, using SP Locomotive No. 5325, an EMD SD7 equipped with a steam boiler; it left the shortly thereafter, as the SD7 was unable to match the performance of the 4-6-2 steam locomotives then being used for off-peak and weekend service. SP began testing Fairbanks-Morse (F-M) "Train Master" H-24-66 locomotives in late 1953, and purchased two of the four demonstrator models for use on the Peninsula Commute service. Because the existing "Suburban" and "Harriman" passenger cars then prevalent in the fleet took steam heat from the locomotive boiler, SP passenger diesel engines were equipped with steam generators. The diesel era of the Peninsula Commute began on August 25, 1954 when two Train Masters went into test service. The Train Masters, which used the unique opposed-piston two-stroke 38 8-1/8 prime mover developed by F-M for American diesel-electric submarines in World War II, were the most powerful diesel-electric locomotives available at a nominal 2,400 hp (1,800 kW), and had performance comparable to the 4-8-4s for peak service: while the starting tractive effort of the "General Service" class 4-8-4 ranged from 63,230 to 66,330 lbf (281.3 to 295.1 kN), the Train Master was rated at 79,500 lbf (354 kN). The Train Masters were complemented by a fleet of EMD GP9s fitted with steam generators; while peak-hour trains required one Train Master or two GP9s, off-peak and weekend trains could more economically use a single GP9. Switching duties were handled by an ALCO RS-32, or an ALCO S-4. When Amtrak took over inter-city (main-line) service in 1971, the SP EMD SDP45s then in main-line use were reassigned to Commute service, and three unique passenger-equipped EMD GP40P-2 engines were delivered in 1974, allowing SP to retire all of the Train Masters by 1975. The fleet of EMD GP9s, SDP45s, and GP40P-2s were used by SP to run the Peninsula Commute. In 1978, SP pulled the SDP45s from Peninsula Commute service to comply with an ICC order to return freight cars. Amtrak leased fifteen GE P30CH locomotives to SP to keep the commuter rail service running, but none of the GE engines were equipped with steam generators. After 1980, the SP fleet continued in leased service to the nascent state-run CalTrain service until the state of California ordered new EMD F40PH locomotives, which were delivered in 1985. Shortly after the introduction of the F40PHs in 1985, a brake issue was discovered, forcing the F40PHs to briefly run in tandem with an SP locomotive. Pullman? Harriman 19xx–20xx approx. 90 72 c.1900–1968 Ordered in 10 groups (60-C-1 to 60-C-10), passenger compartment nominally 60 feet (18 m) long, for main-line service. Introduced to the Peninsula Commute in the 1930s to replace earlier wooden cars still in service. Out of service by 1968. At least two (#1949 and #1975) survive in service for the Niles Canyon Railway. Thirteen cars have since been restored and converted to electric heating, and are currently in service with the Grand Canyon Railway. Several have been preserved at the Golden Gate Railroad Museum, Niles Canyon Railway, Railtown 1897, Western Railway Museum, and other locations. 2089, 2092, 2115, 2120, 2128, 2130, 2135, 2142, 2145, 2152 10 Classified as "unserviceable" in 1980 and used as parts cars. Pullman? Streamline 2202 1 122 1965–71? ex-Daylight #2400 or 2401, built in 1937. Rebuilt in 1965 with five-across seating. Sold to Stockton Terminal & Eastern in 1971. Currently owned by the Northwest Rail Museum and stored near Tillamook, Oregon. Six were sold to Transcisco Tours and have subsequently been purchased by BNSF Railway for use as business cars and track geometry cars (ex-3700–3703, 3707, 3708). 3731–3745 15 164 1968–1985 Distinguished by fluorescent lights, tinted windows, and stainless steel vestibule doors compared with prior series. Group 85-MLC-3 (1968; qty 15; #3731–3745; built by P-S). The entire fleet of 46 gallery cars was purchased by Tillamook Repair Car for service on Tour Alaska (later Princess Tours) in 1986 and four were rebuilt as Ultra Domes (ex-3734, 3740, 3744, 3745) with 90 seats. The earlier wooden and steel-framed coaches were replaced with the all-steel 72-seat "Harriman" coaches starting in approximately 1900. SP introduced slightly longer all-steel 96-seat "Suburban" coaches in 1924, and continued to run them until the introduction of new state-owned equipment in 1985. The 1980 lease agreement between SP and the State of California showed a total of 83 passenger cars in revenue service: 27 operable "Suburbans", 10 "Suburbans" suitable for parts (nearly all "Suburbans" dating back to 1924), and 46 "Gallery" cars. As of 2017[update], several "Harriman" and "Suburban" coaches survive (including all 27 operable "Suburbans"); thirteen "Suburbans" are still in revenue service for the Grand Canyon Railway, while others are in use on the Niles Canyon Railway, Sacramento Southern Railroad, Western Railway Museum, among others. SP rolled out Pullman-built "Gallery" cars with two passenger decks in 1955; passengers on the upper deck sat on two balconies along the sides of the car, and the center aisle was open to allow conductors to check tickets on both levels without having to ascend stairs. A Streamline coach from the Daylight service was converted for Commute use in 1965 by adding five-abreast seating (one seat for two, and another seat for three across the aisle) for a total of 122 seats. It was not popular and was sold to the Stockton Terminal & Eastern in 1971. Instead, to increase passenger capacity, SP purchased a third flight of "Gallery" cars, delivered in 1968, which may be distinguished from the 1955/57 Gallery cars by a different window configuration. "Gallery" and "Subs" could be mixed to make up multi-car consists. In 1978, a Commute train had from one to nine cars, and were always led by a locomotive, meaning the locomotive needed to be turned at each terminal. With the introduction of new state-owned locomotives and rolling stock in 1985 capable of push-pull service, locomotives no longer needed to be turned. ^ Prices are One-way/Round Trip [Monthly]. Starting in 1973, no discount was applied to round trip tickets, which were priced at 2× the one-way fare, so round-trip prices are not shown for 1973 and later. ^ Revised mileage based on 1907 Bayshore cutoff route. Stations are coincident from San Bruno south to San Jose. 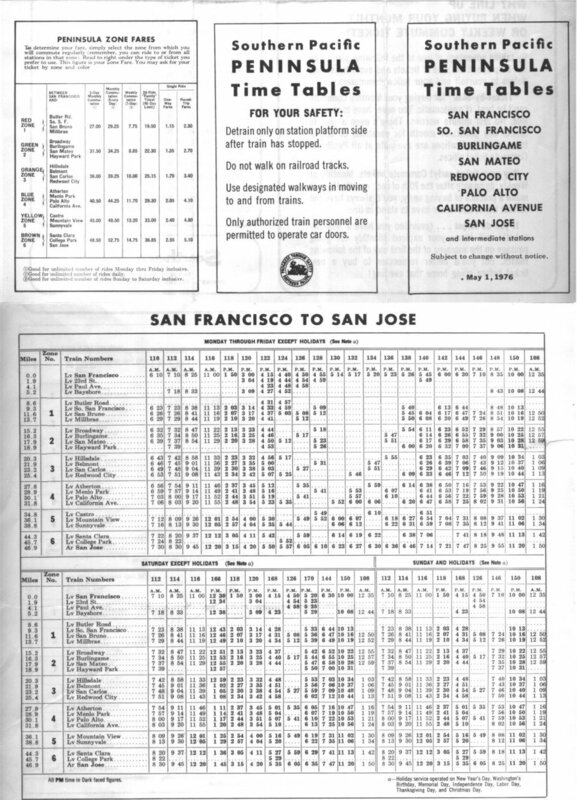 ^ Time tables prior to 1964 include the Vasona Branch line, listing prices (but not schedules) for destinations along branch line starting at Mayfield (California Ave) including Los Altos, Loyola, Simla, Monta Vista, Congress Jct. and terminating at Los Gatos. ^ Butler Road moved between Zone 1 and SF several times. ^ Lomita Park was closed in the 1960s. ^ Round trip and single-rider monthly commutation not sold for Beresford. Family commutation sold for US$14.00 (equivalent to $421.62 in 2018), good for thirty one-way trips within six months. ^ Round trip and single-rider monthly commutation not sold for Castros. Family commutation sold for US$22.00 (equivalent to $662.55 in 2018), good for thirty one-way trips within six months. ^ Round trip and single-rider monthly commutation not sold for Murphys. Family commutation sold for US$25.00 (equivalent to $752.90 in 2018), good for thirty one-way trips within six months. ^ Round trip and single-rider monthly commutation not sold for College Park. Family commutation sold for US$25.00 (equivalent to $752.90 in 2018), good for thirty one-way trips within six months. Peninsula residents clamored for lower fares as early as 1908; SP officials replied by pointing out rates were already cheaper than similar services in New York, Boston, Philadelphia, Chicago, and Baltimore. A discount 10-ride ticket was introduced in 1909 to partially defray rates for frequent commuters. In 1910, SP added that rates across the Bay were comparable, and maintenance of the line between San Francisco and San Jose, partially paid by fares, was expensive. Although SP purchased the electric railway connecting Palo Alto and San Jose, bringing hope that it would be extended further north, it turned out the purchase was merely a strategy to eliminate competition. When fares began to be regulated in 1912, associations in Peninsula cities and Santa Clara County filed complaints against SP, citing rates that were significantly higher than fares to Alameda County destinations of similar distance. The higher rates to Peninsula destinations was believed to cause slow growth of properties on the Peninsula. The suit was heard on August 26, 1912, and after it became clear that many cities felt the rates were excessive and that a rate cut would happen, SP asked for a continuance to put together a compromise. Also in 1912, SP proposed that private club cars be provided on several morning trains to allow commuters to "enjoy a shave or shampoo and indulge in convival highball while making their daily trips to San Francisco." ^ a b Daggett, Stuart (1922). Chapters on the History of the Southern Pacific. New York, New York: The Ronald Press Company. p. 120. Retrieved 8 July 2016. ^ "Cuts Time Seventeen Minutes". San Francisco Call. 100 (79). 18 August 1906. Retrieved 27 April 2017. ^ "Road completes new "Y"". San Francisco Call. 104 (119). 27 September 1908. Retrieved 27 April 2017. ^ "Four Tracks for S. P. Company". San Francisco Call. 101 (3). 3 December 1906. Retrieved 27 April 2017. ^ "May Move Terminal Point to Palo Alto". San Francisco Call. 106 (84). 23 August 1909. Retrieved 27 April 2017. ^ "Electrifying of S.P. to be investigated". Sacramento Union. 7 September 1921. Retrieved 27 April 2017. ^ "Not Practicable to Electrify Lines Down Peninsula—Sproule". Sacramento Union. 17 September 1921. Retrieved 27 April 2017. ^ "Grade Crossings to be Abolished". San Francisco Call. 106 (63). 2 August 1909. Retrieved 27 April 2017. ^ "Changes in Commuter Trains Are Announced". San Jose Evening News. 2 March 1942. Retrieved 7 July 2016. ^ a b "S.F. Commuters Face Walking To The Office". Lodi News-Sentinel. UPI. 18 May 1946. Retrieved 7 July 2016. ^ "Commuters In Peninsula Traffic Jam". Berkeley Daily Gazette. 22 May 1946. Retrieved 7 July 2016. ^ Gibson, James K.; Peters, W. R.; Getchel, M. E. (20 January 1955). Southern Pacific Transportation Company: Investigation of Passenger Service, Peninsula Commute operations between San Francisco and San Jose (Report). California Public Utilities Commission; Transportation Division; Engineering Section; Construction, Maintenance and Service. pp. 4–5. Retrieved 20 July 2017. From an inspection of these figures it will be noted that an estimated 11,116 persons commute northward in private automobiles during the morning peak. Some 1,354 use the bus while some 12,825 persons take the train; or expressed in percentage, 44% commute by private automobile, 5.3% by bus and 50.7% by train. Returning southward during the p.m. peak 10,661 persons are estimated to use private automobiles, some 1,476 persons travel by bus, and 12,101 persons travel by train, the percentage distribution for the southward move being by private automobile 44%, bus 6.1% and train 49.9%. ^ Hayler, R.A. (September–October 1964). "Interstate 280: Design of New Freeway Stresses Aesthetics" (PDF). California Highways and Public Works. Division of Highways, Department of Public Works, State of California. 43 (9–10): 33–41. Retrieved 7 July 2016. Construction of this route has already begun. In fact, the first completed portion in San Jose was opened to traffic on March 16, 1964. Other contracts are underway with more coming soon–so soon that the entire 50 miles of freeway are scheduled to be either in operation or under construction in the next five years. ^ Amin, Ratna; Pugh, Graham (28 October 2015). "Will Rail Rule the Bay Area Peninsula Corridor Again?". SPUR: San Francisco Bay Area Planning and Urban Research Association. Retrieved 26 April 2017. ^ a b c Hearing on Review of the Peninsula Commute Service (Report). Joint Committee on Mass Transit, Assembly of the State of California. 6 August 1982. Retrieved 26 April 2017. ^ a b c d e The Feasibility of Upgrading Peninsula Passenger Rail Service (Report). Metropolitan Transportation Commission. 1975. Retrieved 27 April 2017. ^ "Rail strike: Almost everybody is touched". Boca Raton News. United Press International. 10 December 1970. Retrieved 7 July 2016. ^ a b "Court Order Halts 14-Hour S.P. Walkout". Lodi News-Sentinel. UPI. 13 March 1967. Retrieved 7 July 2016. ^ Hofsommer, Don L. (1986). "New Directions". The Southern Pacific, 1901–1985. College Station, Texas: Texas A&M University Press. p. 287. ISBN 978-1-60344-127-8. Retrieved 6 July 2016. ^ "10 Per Cent Rail Discount Okayed In State". Lodi News-Sentinel. UPI. 16 September 1970. Retrieved 7 July 2016. ^ "Americans Turn to Rails in Fuel Crisis". The Milwaukee Journal. UPI. 29 November 1973. Retrieved 7 July 2016. Among lines reporting insignificant differences in passenger volume were the Penn Central Lines radiating from New York City, the Long Island Railroad, the Erie-Lackawanna Railway and the Southern Pacific, which operates commuter trains on the San Francisco peninsula. ^ "Rail riders not wanted". The Spokesman-Review. AP. 1 September 1976. Retrieved 7 July 2016. ^ "Railroad Makes Deal To Quit". Sarasota Journal. UPI. 1 September 1976. Retrieved 7 July 2016. ^ "Commuters Are Bad Business: Railroad Offers Free Vans To Lose Passengers; Would Give Away 1,000 Vehicles To Pool Rides". Toledo Blade. AP. 1 September 1976. Retrieved 7 July 2016. ^ a b c d Public Hearing: Future Public Transportation Plans in the San Francisco / San Jose Corridor Including Implementation of AB 1853 (Report). Assembly Committee on Transportation, Assembly of the State of California. 2 December 1977. Retrieved 26 April 2017. ^ "California discovers the train". Star-News. NY Times News Service. 2 June 1978. Retrieved 7 July 2016. ^ a b California State Assembly. "An act to add and repeal Section 26002.5 of the Government Code, to amend Section 483 of the Penal Code, and to amend Sections 522 and 99260.5 of, to add Sections 707 and 99234.7 to, and to add and repeal Section 99151 of, the Public Utilities Code, relating to transportation, and making an appropriation therefor". 1977–1978 Session of the Legislature. Statutes of California. State of California. Ch. 1216 p. 4093. ^ California State Assembly. "An act to amend Section 29140.6 of, and to add Section 99233.9 to, the Public Utilities Code, to amend Section 7102 of the Revenue and Taxation Code, and to add Chapter 13 (commencing with Section 2540) to Division 3 of the Streets and Highways Code, relating to transportation, and making an appropriation therefor". 1975–1976 Session of the Legislature. Statutes of California. State of California. Ch. 1130 p. 2781. SEC. 14. (a) The Metropolitan Transportation Commission shall conduct a study on alternative forms of transit development within the West Bay Corridor in the San Francisco Bay area. ^ California State Assembly. "An act to amend Sections 14035 and 14035.5 of, and to add Sections 14035.6 and 14035.65 to, the Government Code, relating to intermodal terminal facilities". 1979–1980 Session of the Legislature. Statutes of California. State of California. Ch. 568 p. 1556. ^ a b Intercity and Commuter Rail Services in California (PDF) (Report). California Transportation Commission. January 1985. Retrieved 26 April 2017. ^ California State Assembly. "An act to amend Sections 14000.5 and 14038 of, to amend and renumber Section 14036 of, to add Sections 14031.6, 14031.7, 14031.8, 14031.9, 14031.10, 14034, 14035.3, 14036, 14038.5, and 14538 to, and to repeal and add Section 14035 of, the Government Code, and to amend Sections 707, 99313, and 99316.5 of, to add Sections 708, 730.7, and 763.1 to, and to repeal Section 99318.5 of, the Public Utilities Code, relating to transportation". 1981–1982 Session of the Legislature. Statutes of California. State of California. Ch. 1183 p. 4769. 14031.9. (b) Any existing commuter service funded under Section 14031.6 shall be eligible for those funds, commencing with the 1984–85 fiscal year, only if it maintains a ratio of fare revenues to operating costs of at least 40 percent during the previous year of operation. ^ Grand Jury (2005). San Mateo County Transit District Contribution to the Peninsula Corridor Joint Powers Board (PDF) (Report). Superior Court of San Mateo County. Archived (PDF) from the original on 29 November 2010. Retrieved 6 July 2016. In December 1991, San Mateo County Transit District, the City and County of San Francisco, and the Santa Clara County Transit District (the member agencies) established the Peninsula Corridor Joint Powers Board (Joint Powers Board) to operate commuter trains using the Southern Pacific Right of Way in the three counties. The purchase price of the Right of Way was $202 million. Through a bond issue, the State of California contributed $120 million. Payment of the balance was allocated by the Joint Powers Board among the three member agencies based on a mileage formula. San Mateo’s share was $39.1 million (47.7 %), Santa Clara’s share was $34.6 million (42.2%), and San Francisco’s share was $8.3 million (10.1%). Due to the lack of funds from San Francisco and Santa Clara Counties at the time the agreement was signed, San Mateo County Transit District (SamTrans) agreed to contribute Santa Clara’s and San Francisco’s shares in order to insure [sic] acquisition of the Right of Way. All parties to the agreement understood that neither San Francisco nor Santa Clara had any legally enforceable obligation to repay the contribution. Santa Clara and San Francisco Counties may at their election undertake good faith efforts to repay the contribution in a lump sum or through a repayment schedule. ^ a b c d e f "Southern Pacific's Final Peninsula Commute Fleet Roster". Southern Pacific. 1980. Retrieved 25 April 2017. ^ a b c d e f g h i j Douglas, Don (November 1999). "Southern Pacific Commute Trains in the Steam Era". The Ferroequinologist. Archived from the original on 21 August 2002. Retrieved 25 April 2017. ^ W.O. "The Last Steam-Powered "Peninsula Commute"". Wx4's Dome of Foam. Retrieved 25 April 2017. ^ a b c d e f Percy, Richard A. (2007). "Southern Pacific Commute Trains in the Diesel Era". Espee Railfan. Retrieved 25 April 2017. ^ a b "Amtrak GEs Take over Espee Commuter Work". Pacific RailNews. Vol. 18 no. 7. July 1978. pp. 12–13. Archived from the original on 2014-09-12. ^ "The Golden State Class". Steam Locomotive. Retrieved 28 April 2017. ^ "FM H24-66". The Diesel Shop US. Retrieved 28 April 2017. ^ Percy, Richard A. (2010). "Southern Pacific Fairbanks-Morse H-24-66". Espee Railfan. Retrieved 26 April 2017. ^ Jacksich, Drew (January 2008). "SP GP9 #3195 with CalTrain F40 #911 August 1985". TrainOrders. Retrieved 25 April 2017. ^ E.O. "SP Commute Cars, 1: Harrimans and Subs". Wx4's Dome of Foam. Retrieved 25 April 2017. ^ a b E.O. "SP Commute Cars, 2: Galleries and the #2202". Wx4's Dome of Foam. Retrieved 25 April 2017. ^ "Southern Pacific #1949". Niles Canyon Railway. 2017. Retrieved 25 April 2017. ^ "Southern Pacific #1975". Nicles Canyon Railway. 2017. Retrieved 25 April 2017. ^ "Train Equipment". Xanterra/Grand Canyon Railway. 2017. Retrieved 25 April 2017. ^ "Southern Pacific Coaches Nos. 2097, 2143 & 2156". Golden Gate Railroad Museum. 2017. Retrieved 25 April 2017. ^ "Collection". Niles Canyon Railway. 2017. Retrieved 25 April 2017. ^ "Historic Rolling Stock". Railtown 1897 State Historic Park. 2017. Retrieved 25 April 2017. ^ "Mainline Railroad Cars". Western Railway Museum. 2017. Retrieved 25 April 2017. ^ "Our Collection: Logging & Other Railroad Rolling Stock". Timber Heritage Association. Retrieved 25 April 2017. ^ Brumberg, Ted (6 July 2014). "NRM # 2202". Railroad Picture Archives. Retrieved 25 April 2017. ^ LaBoda, J.M. "Business Car Photo Index: Burlington Northern Santa Fe 40-63". Passenger Car Photos. Retrieved 5 May 2017. ^ Lerten, Barney (17 March 1988). "Old rail cars become 'Trains of the Century'". Mohave Daily Miner. UPI. Retrieved 5 May 2017. ^ Combs, John (21 May 2016). "Princess Rail Cars". Alaska Rails. Retrieved 25 April 2017. ^ Moore, Jody (2005). "Princess Tours 2005 car refitting, part 1". TrainWeb. Retrieved 25 April 2017. ^ Klein, Fred (2013). "Southern Pacific commuter train (San Francisco peninsula), 1956-1960s". TrainWeb. Retrieved 26 April 2017. ^ Klein, Fred (2013). "Southern Pacific commuter train (San Francisco peninsula), 1960s-1985". TrainWeb. Retrieved 26 April 2017. 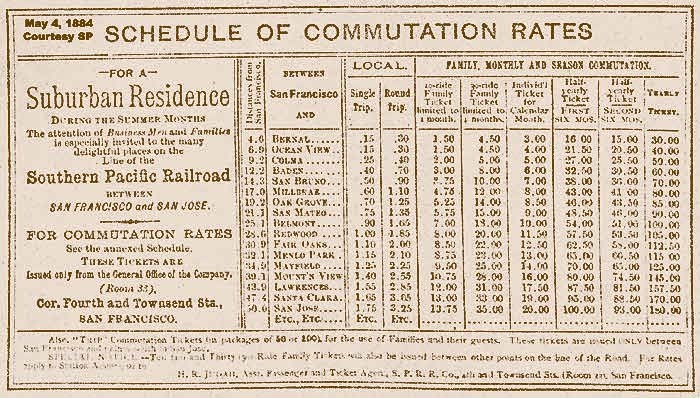 ^ "Schedule of Commutation Rates". wx4's Dome of Foam. Southern Pacific. 4 May 1884. Retrieved 20 July 2016. ^ "Coast Division: Time Schedules of Passenger Trains: Monterey Line—Broad Gauge" (PDF). wx4's Dome of Foam. Southern Pacific. 25 June 1899. Retrieved 20 July 2016. ^ Southern Pacific (5 May 1938). wx4, ed. "Southern Pacific Time Tables: San Francisco, So. San Francisco, Burlingame, San Mateo, Redwood City, Palo Alto, Mayfield, San Jose, Los Altos, Los Gatos" (PDF). wx4's Dome of Foam. Retrieved 18 July 2016. ^ Southern Pacific (27 September 1953). mpar21, ed. "Southern Pacific Time Tables: San Francisco, So. San Francisco, Burlingame, San Mateo, Redwood City, Palo Alto, California Avenue, San Jose, Los Altos, Los Gatos". flickr. Retrieved 18 July 2016. ^ Southern Pacific (28 September 1958). Jafafa Hots, ed. "Southern Pacific Time Tables: San Francisco, So. San Francisco, Burlingame, San Mateo, Redwood City, Palo Alto, California Avenue, San Jose, Los Altos, Los Gatos". flickr. Retrieved 18 July 2016. ^ Southern Pacific (12 May 1968). wx4, ed. "Southern Pacific PENINSULA Time Tables: San Francisco, So. San Francisco, Burlingame, San Mateo, Redwood City, Palo Alto, California Avenue, San Jose, Los Gatos". wx4's Dome of Foam. Retrieved 18 July 2016. ^ Southern Pacific (22 December 1953). mpar21, ed. "Southern Pacific PENINSULA Time Tables: San Francisco, So. San Francisco, Burlingame, San Mateo, Redwood City, Palo Alto, California Avenue, San Jose". flickr. Retrieved 18 July 2016. ^ "Southern Pacific PENINSULA Time Tables: San Francisco, So. San Francisco, Burlingame, San Mateo, Redwood City, Palo Alto, California Avenue, San Jose and intermediate stations". Espee Railfan. 1 May 1976. Retrieved 7 July 2016. ^ "Southern Pacific PENINSULA Time Tables: San Francisco, So. San Francisco, Burlingame, San Mateo, Redwood City, Palo Alto, California Avenue, San Jose and intermediate stations". Rails Around the Bay. 1 April 1978. Archived from the original on 1 July 2007. Retrieved 7 July 2016. ^ "Peninsula Residents Want Reduced Rates". San Francisco Call. 103 (139). 17 April 1908. Retrieved 27 April 2017. ^ "Peninsula Residents Secure Lower Rates". San Francisco Call. 105 (74). 12 February 1909. Retrieved 27 April 2017. ^ "Peninsula Towns to Get New Local Train". San Francisco Call. 107 (156). 5 May 1910. Retrieved 27 April 2017. ^ "Transportation for the Peninsula". San Francisco Call. 109 (138). 17 April 1911. Retrieved 27 April 2017. ^ "Lower Rates Demanded by City Suburbs". San Francisco Call. 111 (117). 26 March 1912. Retrieved 27 April 2017. ^ "Peninsula Rates Again Attacked". San Francisco Call. 111 (152). 30 April 1912. Retrieved 27 April 2017. ^ "San Jose Objects to R. R. Rates". San Francisco Call. 111 (181). 29 May 1912. Retrieved 27 April 2017. ^ "Discrimination Against the Peninsula". San Francisco Call. 109 (150). 29 April 1911. Retrieved 27 April 2017. ^ "Lower Commuting Rates Demanded". San Francisco Call. 112 (87). 26 August 1912. Retrieved 27 April 2017. ^ "Lower Rates a Certainty for the Peninsula". San Francisco Call. 112 (88). 27 August 1912. Retrieved 27 April 2017. ^ "Private Club Cars are Offered by Railroad". San Francisco Call. 112 (42). 12 July 1912. Retrieved 27 April 2017. Wikimedia Commons has media related to Peninsula Commute. McGovern, Janet (2012). Caltrain and the Peninsula Commute Service. Charleston, South Carolina: Arcadia Publishing. ISBN 978-0-7385-7622-0. Retrieved 8 July 2016. "The Bay Shore and Dumbarton Cut-Offs of the Southern Pacific". The Railroad Gazette. XLII (11): 328–331. 15 March 1907. Morris, Robert (1960–1990). "SP Commute Trains". Robert Morris Photography. Retrieved 25 April 2017. This page was last edited on 20 March 2019, at 16:59 (UTC).